Preventive maintenance is the planned treatment of existing highways and roads that protects the pavement, decreases the rate of deterioration and adds five to 10 years to the service life of the pavement. What is Pavement Preservation and Why is it Important? Pavement preservation –the strategic use of preventive maintenance techniques to extend the life of pavements – saves taxpayer dollars by extending the life of current pavements and delaying very costly reconstruction of the road. 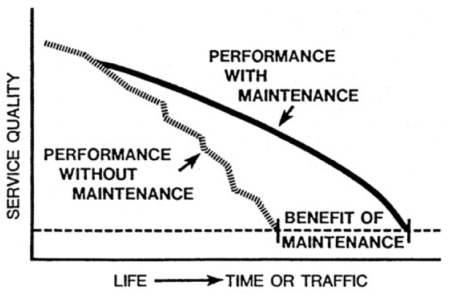 This simple chart below shows the benefit of preventive maintenance. Investing $1 to preserve a road in good or fair condition has been shown to save as much as $6 to $14 as the condition of the road deteriorates to a more-costly state of repair. The goal of pavement preservation is to place the RIGHT FIX, or mix of fixes, on the RIGHT ROAD, at the RIGHT TIME, EVERYTIME. To do that with the limited dollars available to road agencies takes a long-term planning approach and dedication, but it also requires a commitment to public education. The public will not understand why a road agency is “fixing a good road” unless the agency opens a dialogue on preservation. The National Center for Pavement Preservation defines pavement preservation as a cost-effective set of practices that extend pavement life and improve safety and motorist satisfaction while saving public tax dollars. Most agencies in Michigan collect data on the condition of their paved roads and use at least some of the tools in the preventive maintenance toolbox. As new revenue becomes available to road agencies, a pavement preservation plan will help them to manage the public’s expectations with the needs of the entire road and bridge network.